And the racing industry - as even those who love it will admit - is chock full of con artists. 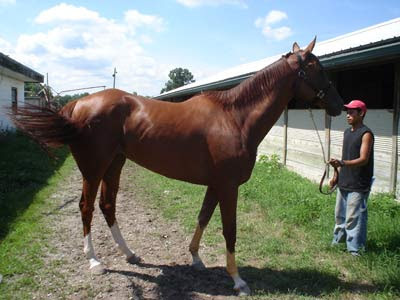 It's full of guys who will tell you that this $4000 colt is going to win so many races he'll fund your retirement. There is a lot of money to be made and more to be lost in racing, an expensive sport where you can lose your shirt not just gambling, but also owning, if you don't know what you're doing (and sometimes even if you DO). Believe the wrong people, and you too will wind up breeding crappy quality Thoroughbreds that don't hold up to race, win nothing, cost you much more than they ever win, and leave you with a lame four year old that you don't know what to do with. While there are nowhere near as many broken down racehorses filling the slaughter trucks as there are overbred stock type horses and mustangs, it is still a problem. Too many people are not breeding for soundness, almost everybody is riding them too early, and almost no one has a plan for what to do when it becomes apparent that Miss Winners Circle is never going to see the inside of one. And so they wind up all over the Internet, looking for new homes. Some good - some not so good. This mare is "broodmare only" because she fractured both knees on the track. You don't say! I'm sure her conformation had nothing to do with that, right? She's got a straight shoulder, one of the lowest set necks I've ever seen on a Thoroughbred, a short croup and a weak, poorly muscled hip. Everything has conspired here to throw this mare's weight onto her front end. She would be a nightmare to collect. She is built to go heavy in front. It's not that big of a surprise her knees couldn't hold up to racing and I would not pick her as a broodmare prospect. Unfortunately, her owner doesn't agree - she's a baby machine who has been popping them out like clockwork. By the way, the "I desperately need deworming" look to the tail really adds to your sale picture! While this filly is clearly still "racing weight" and would look better with a few extra pounds, she's another example of a filly that is not put together to hold up to serious work. Look at those loooong, weak pasterns. Those are always bad news. They stress the tendons, and increase your chances of a bow or other issues. While I'm not that particular about cow hocks, she does have quite a set, and this is another very short croup with a weak loin attachment. This filly may do just fine for light work and she sounds like a sweetheart personality, but I wouldn't breed her or try to do anything high impact with her. Of course they are selling her as a "broodmare prospect." Yack. Here's one that I do like. This is a long yearling filly. 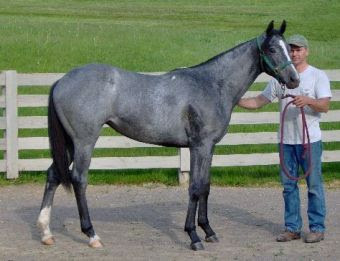 This filly is just the way I like to see a Thoroughbred - compact and balanced. 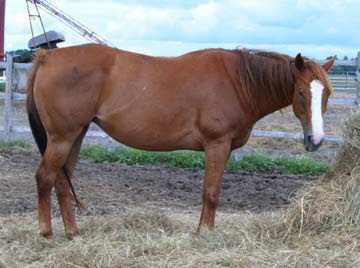 While she is a yearling and is downhill, the way she will look as a mature mare is apparent. She has a powerful hip and a beautiful shoulder. Her neck is set on right where you want it - not too high or too low. I would like a bit more definition between the neck and the chest, but I'm being picky. She also does toe out a bit, but as I've said before, that usually is not the soundness problem that being pigeon toed is - unless it's extreme, and this isn't. Her very cute head doesn't hurt her overall appearance a bit. I do wish they weren't marketing her as "ready to break now." Ugh. For those of you who enjoy these, I found another conformation clinic to test yourself. I like this one because it forces you to see past poor posing and really evaluate the horses. Also, it is a close call between #2 and #3...I picked as the judge did, but basically went ewwwww at both of them. Fortunately they are all geldings!